On Saturday, November 7th, the Genealogy Guys spent the day with us at our Annual Seminar. Were you there? If you weren’t able to be with us, you don’t have to miss out completely. The last session in the afternoon was recorded and is published as this week’s podcast at the Genealogy Guys website. Check it out ?. Be a part of genealogical history on November 7, 2009. You can if you are in the crowd on that day. You will be a participant in the recording of a live “Genealogy Guys” podcast, which will later be placed online and available worldwide. You can even ask the “Guys” questions. Sometime in 2008, I ran across a small item on the internet that a Henry GRIFFIN was once a mayor of Grand Haven. Then last weekend I had some time to delve into him as a subject. My great-grandfather was named for a distant cousin, William Cullen BRYANT the poet and editor of the New York Evening Post. Though the conclusive proof has not been found, family tradition is pretty consistent about this relationship. Acknowledging that there is a tendency in families to claim a connection to a famous person without much proof, I am certainly not going to argue otherwise. I am pursuing every avenue in my search for the truth. But in my research of this BRYANT clan, I have assembled a fair amount of information about the spouses of my great-grandfather. There were four. First was Nelly Loretta PRESTON. 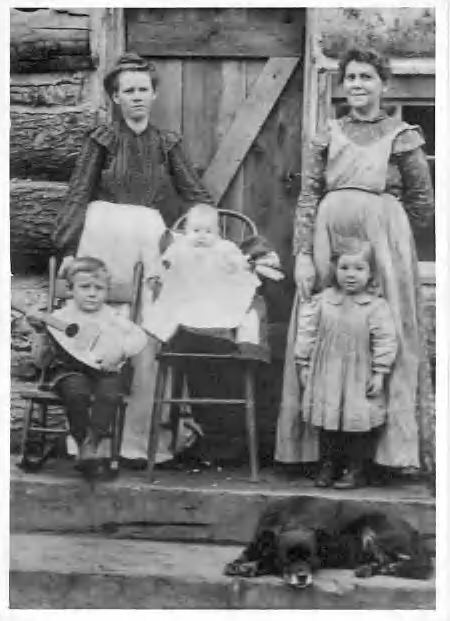 Nelly was born 5 Aug 1867 (“Unrecorded Births of Newaygo County” 1867-1883. Her date of birth from age at death is 21 Aug 1867) in Newaygo County, the daughter of Shinar PRESTON and Eugenia DICKISON. William and Nelly married about 1886 (record of marriage not located) in probably Fremont, Newaygo County, Michigan. Nelly died of paralysis in Sheridan Township, Newaygo County 8 Sep 1887, about two months after the birth of her first child, Lois. Lois BRYANT was enumerated in Dayton Township with her grandparents (PRESTON) at the time of the 1900 census. Lois married after 1914 John WOLD, but died in 1919 (Maple Grove Cemetery, Fremont) a relatively young. What does genealogy have to do with a door?